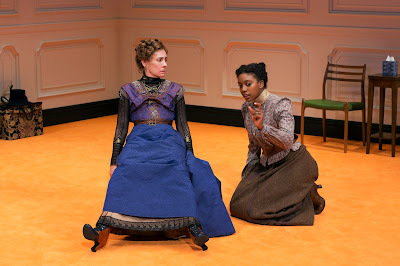 Laurie Metcalf, left, and Condola Rashad are an estranged mother and daughter in "A Doll's House, Part 2." Photos by Brigitte Lacombe. HENRIK Ibsen is a master of the enigmatic psychological drama. His "A Doll's House" is a play in which Nora Helmer finds herself by finding her way out. Lucas Hnath picks up Nora's story years later. "A Doll's House, Part 2," at the Golden Theatre through 23 July, begins with a persistent knock on the door. Nora's (Laurie Metcalf) story in LH's re-imagining bounces like a ping pong ball, highlighting the different ways in which her departure was perceived by each of those affected. Nora has returned to tie up loose ends, or at least one particular loose end. Her old nanny, Anne Marie (Jayne Houdyshell), has mixed feelings about this reunion. What Nora sees as her liberation, Anne Marie considers an abandonment. This view is shared by the husband, Torvald (Chris Cooper), whom she left. When Nora walked out on him, she also deserted her children. As far as Torvald is concerned, Nora walked away instead of trying to work out the problems in their marriage. It is both a conventional and an unusual perspective for their time and circumstances. Torvald (Chris Cooper) is a man who does not understand his wife (Laurie Metcalf) in "A Doll's House, Part 2." "A Doll's House, Part 2" is set in HI's late 19th century. The sparsely furnished home (designed by Miriam Buether) looks modern Scandinavian, but the costumes (by 2017 Tony nominee David Zinn) are luxuriously of the period when Nora walked out the door. The drama straddles our contemporary way of looking at things with HI's. Anachronisms begin with the throbbing beats (sound design by Leon Rothenberg) that greet the audience before curtain-up. They continue with the blunt (and funny) profanities of the dialogue. When Emmy (Condola Rashad) enters to ask her mother what she remembers about her, the unreality of this play is sealed. Nothing is said, or made of, CR's ethnicity in this Norwegian family. 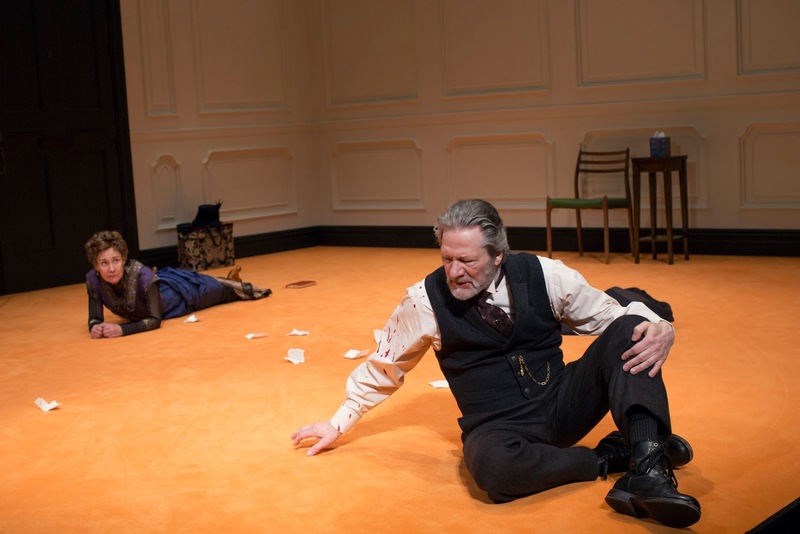 "A Doll's House, Part 2" is a brilliant amalgam of then and now. Emmy's welcome of her mother soon wears into composed self-interest. LM's Nora makes no attempt to charm or connect. She is pleased with herself. Torvald, as played by CC, is a reasonable if exasperated man; like wives of his time, he has little control over his life. 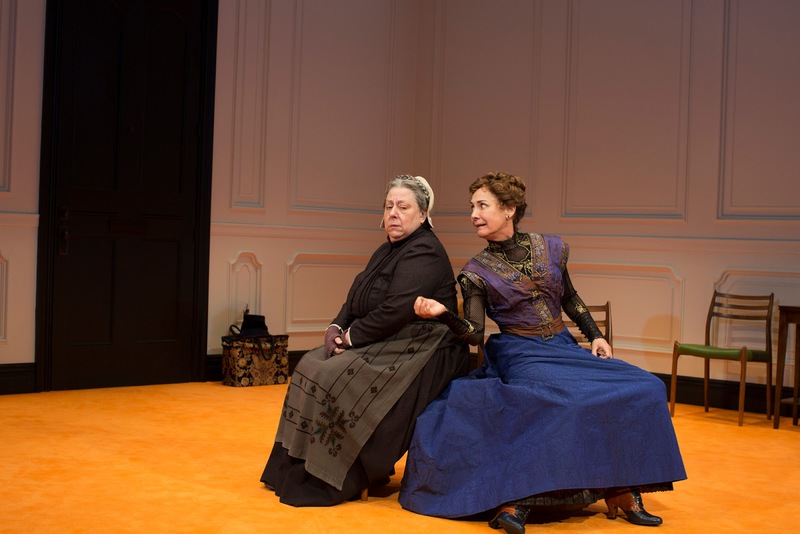 Anne Marie, left (Jayne Houdyshell), doesn't approve of some of Nora's (Laurie Metcalf) decisions in "A Doll's House, Part 2." We are in the midst of Tony season, so congratulations to the entire cast of "A Doll's House, Part 2" - all four are nominees. They are in a play that has been nominated for Best Play and their director Sam Gold has the nod for Best Direction of a Play. Lighting designer, Jennifer Tipton is also nominated for her work. The production is flawless. The comedy in this play relieves the tensions and strains inherent in the theme LH has inherited. "A Doll's House, Part 2" is an ingenious and seriously original work of theater. to learn more about "A Doll's House, Part 2."